Pro-V C&B is a temporary crown and bridge material that quickly and easily creates very durable and natural looking restorations. 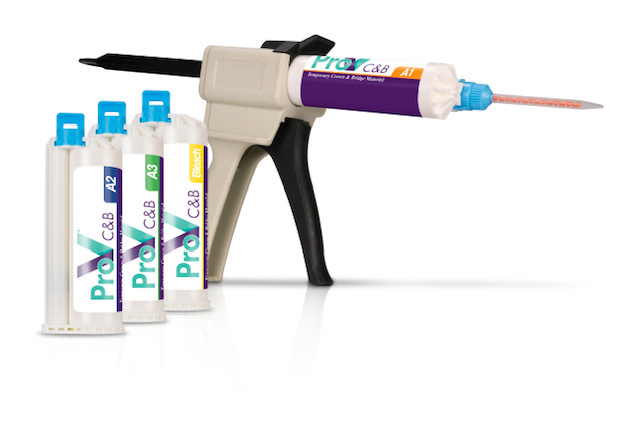 Developed using a multifunctional acrylic composite, Pro-V C&B creates a temporary restoration that is a superb mixture of strength, durability, flexibility and esthetics that emulates a natural tooth. Pro-V C&B is a highly esthetic composite indicated for the fabrication of temporary crowns, partial crowns, bridges, inlays, onlays and veneers – including long-term temporary restorations. Pro-V C&B is a self-curing material available in 4 essential shades, polishes beautifully and can be trimmed with minimal effort making it the ideal temporary crown & bridge material.